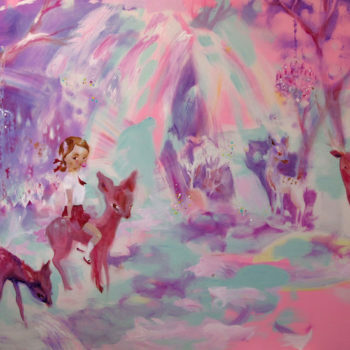 A bit too cute deer, and other fairytale acquaintances such as: unicorns and fairies, rainbow-colored forests and big-eyed tiny-nosed girls. And as a cherry on top of the cake: the color pink. Katja Tukiainen’s imagery consists of many familiar characters drawing from comics in general and from Japanese manga in particular, not to mention the dominating color pink as a reminiscent of everything girlish. Katja Tukiainen who is both an acclaimed painter and a cartoonist has always kept these both sides of her constantly present and affecting with one and other in her body of works. Another common feature is their very personal story. Turning her own experiences, whether from travels or motherhood, into the aesthetics of unreal and kitsch Tukiainen succeeds in creating an eerie universe of completely upside-down implications. Because Tukiainen’s rosy happy world isn’t about cloying clichés remaining clichés, but to heighten them into new connotations with charming irony and irresistible ambiguity. Her female avatars are eternal adolescents surrounded by an enchanting aura of limitless possibilities. Katja Tukiainen (born 1969) has her Master’s Degrees from the University of Art and from the Art Academy of Finland to which she is currently preparing her PhD dissertation. She has exhibited widely in Europe and her cartoon short stories have been published in Europe, India and the U.S.